My 5-year-old daughter has something precious in her hands. It’s perfectly square, with a bright orange body, a black lens, a neck strap, a distinct red dot logo — and it’s making me nervous. The object in question is an instant camera by Leica, the German company famed for its high-quality craftsmanship, more often found around the necks of cult photography aficionados than over-enthusiastic young children. Yet here I am, on a recent rainy day, terrified that she will break it, anxiously holding an umbrella above her head (more to keep the camera dry than her) as she jumps with her usual abandon through puddles in Roppongi Hills, the Tokyo development project. She is transfixed by the fact an instant photo pops out of the side of the camera when she presses a button — and rushes, with great relish, to take five consecutive snaps of a clutch of blue Doraemon figures on display nearby. 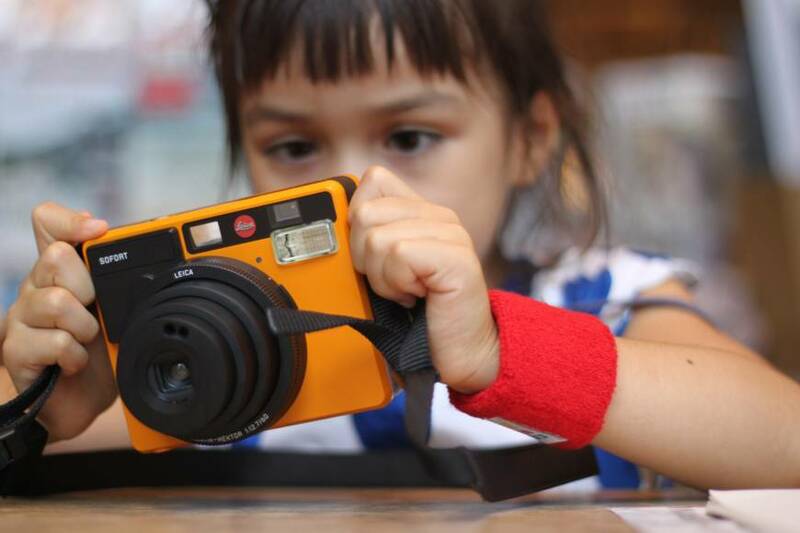 My daughter’s foray into the world of photography took place during Leica’s first kids workshop in Japan, which was organized by Tsutaya Tokyo Roppongi and was one of a wider program of summer events held annually by Mori Building. This year’s schedule includes 408 workshops for children up to the age of 15, the majority at Roppongi Hills (plus a smaller number of events at Ark Hills, Toranomon Hills and Omotesando Hills). With expert collaborators including MIT Media Lab, the offerings range from the futuristic to the analog — including computer programming for kids, themed Lego sessions and rooftop gardening. 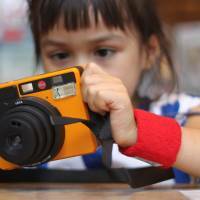 One workshop that particularly appeals, however, is the Leica kids event. My daughter’s photography workshop begins in Roppongi Hills with Leica staff showing children Sofort cameras in three different colors — mint green, white and orange — before asking a winning question: “Which color do you like best?” (She chooses orange without a moment’s hesitation). Charismatic teacher Shigemi Imamichi then appears in front of the children in a symphony of colors — from her wide-brimmed pink hat, blue striped shirt embroidered with bright flowers right down to her silver shoes (my daughter stares in wide-eyed wonder, no doubt wondering if she is some kind of princess). Imamichi proceeds to introduce herself to the children before holding up a series of hand-drawn images to explain how to use the camera. From locating the on/off button and finding the viewfinder to checking the number on the back of the camera to see how many photos are left, her instructions are simple, concise and easy to understand. Plans to shoot the rooftop gardens of nearby Tsutaya are thwarted by the rain, so we first venture through Roppongi Hills (parents holding umbrellas above their children’s heads) before stopping to shoot the outdoor Doraemon figures on display. Mission accomplished successfully (thankfully without any camera-dropped-in-puddle incidents), we head to Tsutaya, where the children are seated around a large wooden table with a large central flower display bursting with reds, pinks, blues and yellow blooms. Here, Imamichi proceeds to direct the children through a string of fun photographic tasks, from taking a photo of the person next to them to shooting pouting selfies, stating how many images of each should be taken as they go along. Imamichi then hands out clutches of flowers to each of the children and they continue with their photographic experimentation by shooting bursts of rainbow-bright flowers. Finally they have free rein to photograph whatever they fancy (my daughter spends a good few minutes taking a picture of a solitary leaf on the tabletop followed by the pattern on my dress). When the shooting comes to an end, each child has taken a total of 20 pictures, which they proceed to place in makeshift cardboard albums with patterned sticky tape, customizing it with a medley of fluorescent pens and stickers. By the end of the two-hour workshop, the children are all proud of their personalized creations. The only downside? Having to give the cameras back at the end of the class — although my daughter cheers up when she remembers the existence of Santa Claus (it’s now top of her list), confidently reassuring me that she will definitely be good for the rest of the year. Meanwhile, I — and no doubt the Leica staff — exhale with relief when the camera has been returned undamaged (and remember that Christmas is still five months away). Kids Workshop 2017 runs until Aug. 28, with prices ranging from free of charge to ¥11,000. A full schedule of events over summer can be found at bit.ly/kidsworkshop2017.